Ever since the unmanned Kepler Space Telescope launched in 2009, it has been on a constant mission to find Earth-like planets that could possibly support life. It has spotted thousands of planets, some of which may prove to be comparable to Earth in size, composition and distance from their stars. But on April 17, 2014, Kepler found the most likely candidate yet for an Earth-like planet. 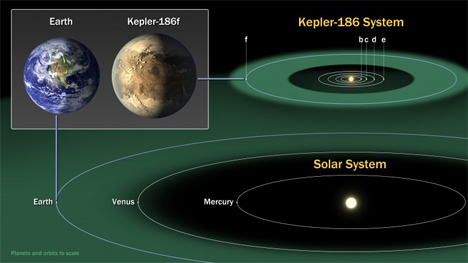 The planet, Kepler-186f, is the first Earth-sized planet Kepler has found that exists in the “Goldilocks Zone” – the area just far enough away from a star to potentially support life. Not too hot, not too cold, and having the potential to contain liquid water. 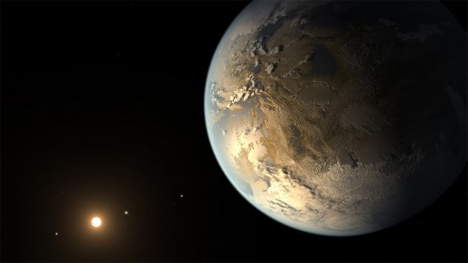 Kepler186-f is just 1.11 times Earth’s size; the next-closest Earth-like candidate was 40 percent larger than Earth. Kepler 186-f only gets about one-third of the energy from its star that Earth gets from the sun, meaning that its sky would be much darker than ours. Since we know nothing about the composition of the planet or its atmosphere, however, it can’t be determined yet whether the temperature on the surface would be welcoming to life. Now that NASA knows the planet is there, they’ll have to research its chemical composition to determine whether it is capable of supporting water and, in turn, life. See more in Space & Time or under Science. April, 2014.